The centrist Emmanuel Macron’s success in the first round of the French presidential election is likely to re-energize Europe. Unlike the other candidates, Macron does not just recognize the need for radical change to the European Union; he supports bringing it through Europe-wide cooperation. 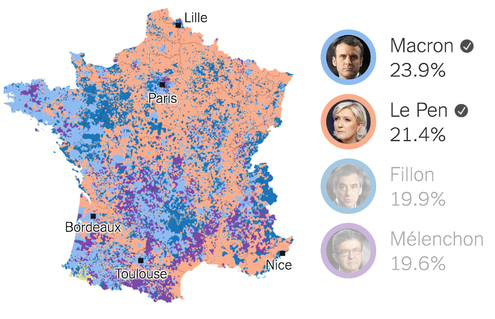 But Macron’s plurality of the popular vote was narrow, and a much larger share of French voters showed support for a very different political vision. But Le Pen was not alone in promoting this vision. One of the candidates who finished fourth, the far-left Jean-Luc Mélenchon, also built his candidacy on simplistic economic populism. For example, like Le Pen, he promised a radical reduction in the retirement age, without explaining how to finance it. And both appealed to Germanophobia, focusing on the European debt crisis and Germany’s insistence on austerity. Le Pen accuses Macron of aspiring to be Vice-Chancellor of Europe, under German Chancellor Angela Merkel, while proudly declaring herself to be the “anti-Merkel.” Mélenchon claims that Germany is motivated by radical individualism, neoliberalism, and the economic interests of an aging population. Even if Macron wins the second round, as expected, he will have to address what drove more than 40% of French voters to support this anti-European vision in the first round. And if he is to reinvigorate support for Europe, he should consider what made Europe attractive in the past – and how it lost its allure. When Europe was most obviously attractive, it was regarded as a way of purging what was bad and corrupt from national traditions. In the 1950s, as two very old men, German Chancellor Konrad Adenauer and French President Charles de Gaulle, moved to reinvent their respective countries, they examined how their vaunted traditions had been undermined by their own elites. Germany had been devastated by Nazism, which, in Adenauer’s view, had been forced on the country by Prussian aristocrats and militarists. In France, according to de Gaulle, the elites weakened the country, before voting to overthrow the Republic in the aftermath of military defeat. With the euro crisis, however, the limits of that reconciliation came to the fore, as did the issue of national decadence. Germany and France clearly needed one another, but found it difficult to understand each other. European policymaking after 2010 was practically a bilateral affair, involving a dominant France and a more dominant Germany. Much like the events of 1940, the euro crisis reflected bad management and bad judgment, and it came to be viewed as a betrayal by the elites. This time, however, it was the European elites – and the national elites who empowered them – who were blamed. The eurozone became the focus of dispute, owing to the constraints that it imposed on member countries. As the crisis progressed, the single currency began to feel like a straitjacket, and voters increasingly became convinced that escaping it would solve the problems that had emerged while bound by it. Interestingly, the eurozone’s debtors and creditors alike share this sentiment. Of course, southern Europe, including France, feels ensnared in a low-competitiveness scenario of high unemployment and stagnant income growth. But even northern Europe – and especially Germany – feels trapped. Despite being portrayed as the eurozone’s major beneficiary, Germany’s trade gains are lower than many assume, especially when struggling southern European countries are importing fewer German goods. What many Germans see, instead, are the financial claims against southern European countries building up in the eurozone’s TARGET2 payments system. This situation, in which both sides feel trapped, can be viewed as a variant of the famous master–slave dialectic in Georg W.F. Hegel’s Phenomenology of Spirit : both sides are equally bound. The slave is not recognized as fully human, or as an equal of the master, and is not free. The master is free, but does not feel recognized as a human by the slave. The master is constantly worried by the fragility of the relationship, and by the fact that the slave is building up an alternative universe of values, in which the master is not represented. The task ahead for a President Macron would therefore be to achieve a kind of Hegelian transcendence, through a process much like that which de Gaulle described in the 1960s. France needs Germany to serve as a model of a social market economy, capable of creating new non-governmental jobs. Germany needs France in order to assert its own place in the world, including from a security perspective. Reconciling these economic and security imperatives is painful, because it means confronting the weaknesses and errors of the past head-on. But it is necessary. France and Germany must again welcome each other chez nous .